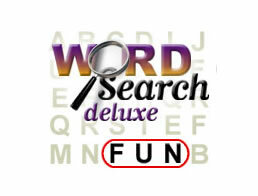 Word Search Deluxe Game - Download and Play Free Version! Challenge Yourself by Searching for Words in This Family-Friendly Game! 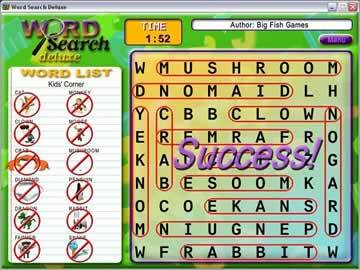 With Word Search Deluxe, you have the option to search for words in multiple game types and difficulty settings. You can even create your own puzzle and choose your own board size, allowing you to customize your very own game! Word Search Deluxe also features a game option for kids that lets them learn new words in a fun and animated environment. Prefer to play word search on paper? In Word Search Deluxe, you can also print out your puzzle and complete it on your own time using a pen or pencil. With a variety of game types and categories of words to choose from, word search lovers of all ages are sure to enjoy Word Search Deluxe. Each time you begin a game, you are presented with a list of words to find. This word list appears to the left of the grid containing the words you must find. Words can be found up, down, horizontally and diagonally. Depending on the game mode you choose, there may also be a timer at the top of the screen. This allows you to keep track of the time it takes you to complete a particular puzzle and attempt to beat your high score. Each word list consists of words from a particular category, such as auto parts, career titles, animals and Hollywood. In addition to the Creativity Center where you can create your own puzzles and play puzzles designed by other players, Word Search Deluxe has three main game modes. These include Kids' Corner, Competitors' Alley and Puzzle Fun. Each mode presents you with a different way to play the game and with varying levels of difficulty. As the name suggests, Kids' Corner is designed for children and allows them to learn new words. In comparison to the other game modes in Word Search Deluxe, the words in this game type are presented on a larger grid with words that are easier to find. There are 12 words to find and they are all within the animal category. To make this mode more enjoyable for children, each word is accompanied by an animated picture and a sound effect is played each time a word is successfully found. For example, the appropriate sound for a gorilla is played when the word is matched. Marathon mode: Marathon mode allows you to search for words in a multi-level format. Speed is an important factor in this game as you must discover all the words within a specified period of time and get to the next level. The number of points you receive depends on how quickly you are able to find all of the words. There is a timer at the top of the grid and more time is added each time you find a word. Your game ends when time runs out. Timed mode: In timed mode, you select the category of words you would like to find and race against the clock to find them. This mode is designed for players who prefer a fast and furious pace. Categories of words include animals (birds, dog breeds, fish, insects, sea animals), science and nature (gemstones, weather, body parts, modes of travel), art and leisure (baseball, classic TV, food and drink, Greek mythology) and people and places (actors and actresses, at the beach, classical composers, bodies of water). Word mystery mode: Mystery mode changes the traditional way to play word search. In this intriguing game mode, you do not know which words you are looking for. Each time you successfully find a word it is revealed in the word list. You also being timed in this high-pressure, challenging game mode. Puzzle fun features a casual word search environment without any competitive scoring or time pressures. In this game mode, you can choose the category and number of words you would like to find. With the Creativity Center, you can design your own unique puzzle and share it with other players throughout the world. This game mode also allows you to download and play puzzles that have been created by other players. Since the list grows daily, the Creativity Center allows for endless gameplay options!